Yep, I am starting yet another giveaway, this one for an early Valentine so it will end on Valentine's Day! This one will be for a Karmin G3 Salon Pro Touramline Hair Straightening Flat Iron. To Enter the Giveaway FOLLOW my blog and LEAVE a COMMENT (no anonymous comments you must be a PUBLIC follower) on this blog post with all the info below that you complete. 2. You must leave a valid e-mail in your comment that I can contact you at. 3. If you win I will send you an e-mail and you must respond within 48 hours or another winner will be picked. 4. Please do not comment multiple times...leave everything you do in one comment. Thanks for the giveaway! Great way to celebrate Valentine gift! I NEED a new flat iron. i'm a follower to gfc as A.M.S. Ooohh I hope this is international. I follow you via GFC and on youtube(maddailade). This is by the best give away on a blog! I wish I had more followers, I'd love to do giveaways! 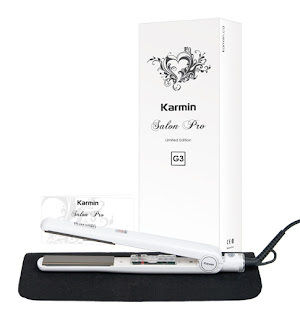 This straightener looks amazing!! Thanks for the giveaway! I would ABSOLUTELY LOVE to win this giveaway! but oh well, i guess everybody would! I follow you as NereaM with GFC and as NeritaL89 in Youtube. I follow your youtube channel. Mi nick is chyspita. Please enter me :-) THXS! Follow you on Twitter as @monikaretnani and tweet about this giveaway here. Follow your Youtube Channel as mretnani. <3 Thank you so much for having these giveaways! i'm following via GFC as casey aimee. - followed your blog via GFC as "aiNe"
- followed you on Twitter as "luvndprizeoflyf"
- blogged about your giveaway in Lovin' the Prize of Life! - posted the giveaway image on my left sidebar in Lovin' the Prize of Life! - added you in my blog list on the right side of Lovin' the Prize of Life! New follower via GFC, as fisiwoman. Do I have to subscribe by e-mail or does gfc count? I follow via gfc as nicolthepickle. I follow on youtube as nicolthepickle1. Hi! I follow you via gfc (under same name) plus I follow you on youtube (kalcedon). Follow via GFC as Silverstargirl. and I tweet about this giveaway here. Awesome giveaway! :D I follow via GFC as SkellyBones. added you on my blogroll. Thank you.. I really need one of these! :D Good luck everyone! This is an awesome giveaway! my straightener is dying, I so need a new one haha. I follow your blog via GFC as Ezzy.